Cover of “Wake of the Riddler,” by Janet Morris, a Sacred Band Tale available as a stand-alone Kindle edition or as part of “the Fish the Fighter and the Song-girl” by Janet Morris and Chris Morris, from Perseid Publishing. 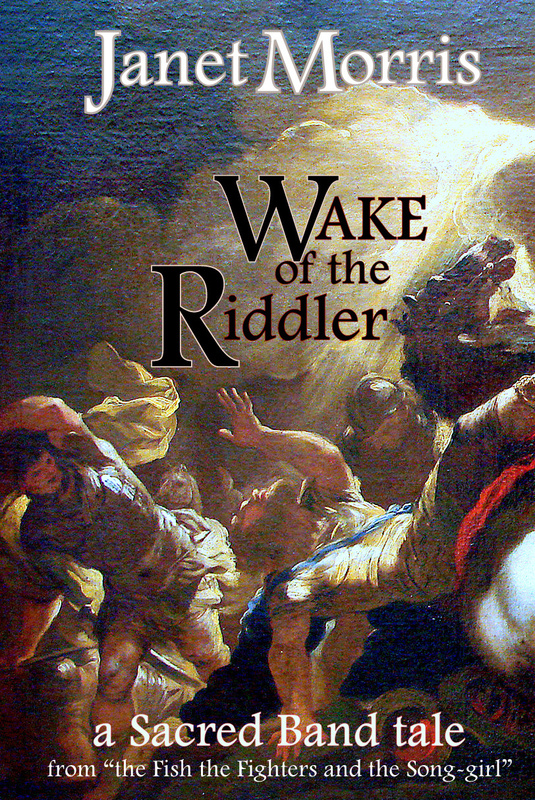 Wake of the Riddler can now be yours. This entry was posted in ancient warfare, Books, Mythic Novel, Novel, Uncategorized and tagged ancient cavalry, ancient warfare, Chris Morris, dark fantasy, Enlil, epic fantasy, gaming, Heraclitus, heroic fiction, historical, historical fantasy, Janet Morris, literature, mythic fiction, Niko, novel, philosophy, sacred band of stepsons, sacred band of stepsons series, Sacred Band Tales, Sacred Banders, sanctuary, Science Fiction Book Club, Stepsons, Storm God, Tempus, The Sacred Band, thieves' world, Wizardwall.